This trip highlights what this island has to offer. Discover the famed Hindu cultural experience that makes this island ‘home of the gods’. All while enjoying striking rice fields and fascinating underwater world. This Tour also take you off the beaten track to witness the daily life of the locals behind the scenes. Some nice walks through beautiful nature, remarkable Hindu temples, traditional villages and local markets underneath the tropical sun. Arrive / Leave Denpasar > Drive Canggu 3 Nights (Fisherman Village) > Ubud 3 Nights (Rice Field and Herbal Walk) > Drive Lovina 3 Nights > Drive Denpasar & Leave. Upon arrival in Denpasar airport you are met and transferred by Private Vehicle to Canggu. Upon arrival in Canggu check in at your pre booked Hotel. Canggu is small fisherman village, situated at the southwest coast of Bali. It is a continuation of the better-known resorts such as Kuta, Legian and Seminyak. In the early morning the fishermen sell their fresh catch to the villagers and in the afternoon the quiet beach of Canggu is a place for one of the most beautiful sunsets in Bali. Overnight stay at the Hotel in Canggu . Today a Private car and English-speaking driver pick you from your hotel for a trip to several interesting sights in the surrounding area of ??Canggu. Your visit today includes the refined temple Pura Taman Ayun, which means ‘big garden’. This temple is surrounded by a moat and symbolizes the cosmic sea in the Hindu world. The meru towers represent the mountains, the home of the gods. The highest meru, with eleven floors, symbolizes the mountain Gunung Batukau. It is thought that the Pura Taman Ayun, located on an axis connecting the mountains to the sea, ensures the smooth circulation of water from the mountains of Bali to the rice fields, then to the sea and then back to the mountains. You continue for a visit to the famous temple Tanah Lot. For the Balinese this is a very important sea temple. It was said to be founded by the 16th-century Javanese priest Danghyang Nirartha. The temple is built on a rock, which is called ‘gili beo’ or ‘bird island’ because of its shape. Only at low tide the connection to the mainland is visible. You can discuss your specific interests with your driver who can adjust the tour to your wishes. Overnight stay at the Hotel in Canggu. The afternoon is at your own leisure. Visit the center with its many shops, galleries, restaurants, museums etc. Make short hikes in the vicinity or rent a bike to explore the surroundings of Ubud. You can also visit a number of parks (bird- or elephant parks). In the evening you can witness one of the Balinese dance performances in the surroundings. Today you go for a fascinating walk of approximately 3 hours. The older generation in Bali have used traditional medicines all their lives. The wide variety of plant life grows along the edges of the sawahs and provides food and medicine. During this walk your local guide will explain how to embrace the old ways of herbal treatment. In addition you learn about the Balinese methods the farmers use to cultivate the rice. 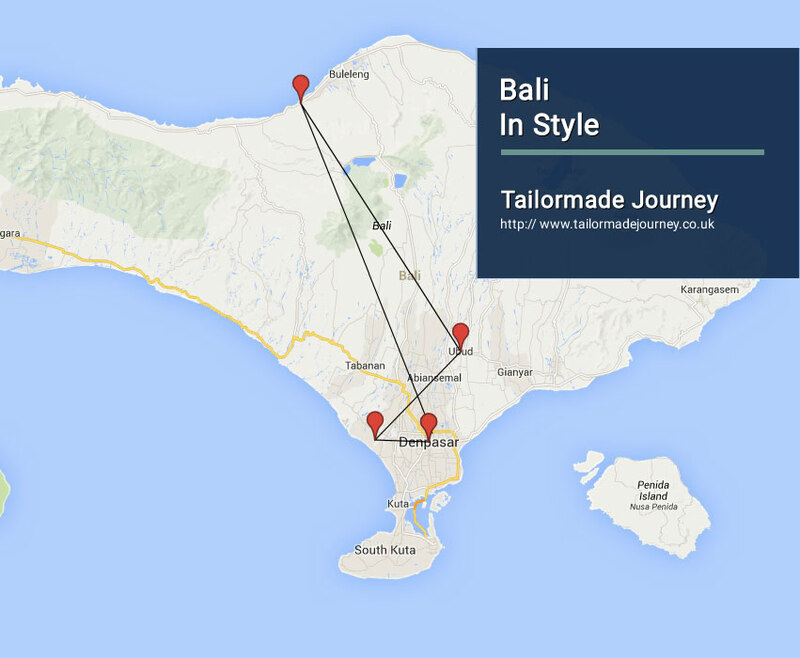 The East of Bali is rarely visited although you find the best rice-terraces, temples and traditional villages here. Today we make a day-tour to this interesting area. We will visit the tranquil water-palace of Tirtagangga and walk through the traditional Bali Aga village Tenganan where they weave the valuable double-ikat. You will stop at the palace of Klungkung with its special paintings and enjoy the fantastic views of the rice-terraces and Mount Agung. Time to swim in the pool or the sea, walk around Lovina, swim with dolphins in a salt-water pool or just laze at the hotel. Early in the morning you board a small outrigger that takes you to the sea, searching for dolphins that can often be seen off the coast. Around 8.00 o’clock you return and have breakfast. A private car and driver pick you up from your hotel. First you can stop in Singaraja where it is possible to visit a colorful and lively market. A scenic and winding road leads via Lake Bratan, Lake Tamblingan and Buyan to Munduk. This is a typical Balinese village, with its village-temple, busy morning-market and Balinese houses. The villagers make their living growing cloves and rice. There are rice-terraces and clove-plantations as far as the eye can see! This area is ideally suited for long and short hikes. We drive back to Lovina via a different route. Just before you reach the coast again you can visit a Buddhist monastery and the Banjar hot springs. Today you are transferred to Denpasar Airport to board Flight for your inward Journey.